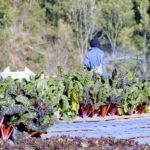 If you’ve been wondering how to grow swiss chard (Beta vulgaris subsp. cicla), you probably enjoy greens tremendously. You get a lot of Vitamin A from dark leafy vegetables, and swiss chard is no exception. Swiss chard is actually a beet that doesn’t produce a bulbous root. These wonderful plants do, however, produce many large, dark leaves that can have red, white or yellow stalks. These leaves are perfect in dishes that include greens. How Do I Plant Swiss Chard? One of the best tips for growing swiss chard is to plant the seed early. By early, this means getting the seeds planted in early to mid spring. There are no swiss chard planting dates that are exact and no exact rules on how to grow swiss chard. Watch and make sure all signs of frost are over because the soil has to be at least 50 F. (10 C.) for the seeds to germinate. It should also be loose and well draining. Locate the plants in a full sun to partially shaded area of the garden. Another good tip for growing swiss chard is to plant the swiss chard seeds directly into the ground about ¼ to ¾ inches deep. You can put eight to ten seeds per foot of row planted. Once the plants grow and are a couple of inches tall, thin them to about 4 to 6 inches (10-15 cm.) apart. When the growing swiss chard plants are 9 to 12 inches (23-30 cm.) tall, you can start harvesting them. Swiss chard harvesting, however, the first time around should include picking the whole plant and throwing away the root. Swiss chard harvesting this way ensures enough space for the remaining plants to fully grow. So long as your swiss chard has been given sufficient water, they can grow to two feet (60 cm.) in a season. Plant your swiss chard among other winter vegetables like carrots, turnips, spinach and parsnips. These veggies all go well together on a winter Sunday dinner table with a good roast. Late in the fall when you want some swiss chard, harvesting it along with other winter vegetables for the Sunday table is a great way to serve your family a decent dinner. Enjoy fresh swiss chard until the first frost.